Two Crossed the Finish Line! It feels so good to have two finishes – and they’re both UFO’s for my guild’s challenge! That’s now six out of twenty. I should have empty project boxes now – not so. Projects that were in zip loc bags are now in the project boxes. It’s quite the cycle! The baby quilt has squares in it from a panel I purchased that was meant for a soft baby book. There are enough squares for two more quilts. It was fun to pull pieces of fun prints and put them all together. 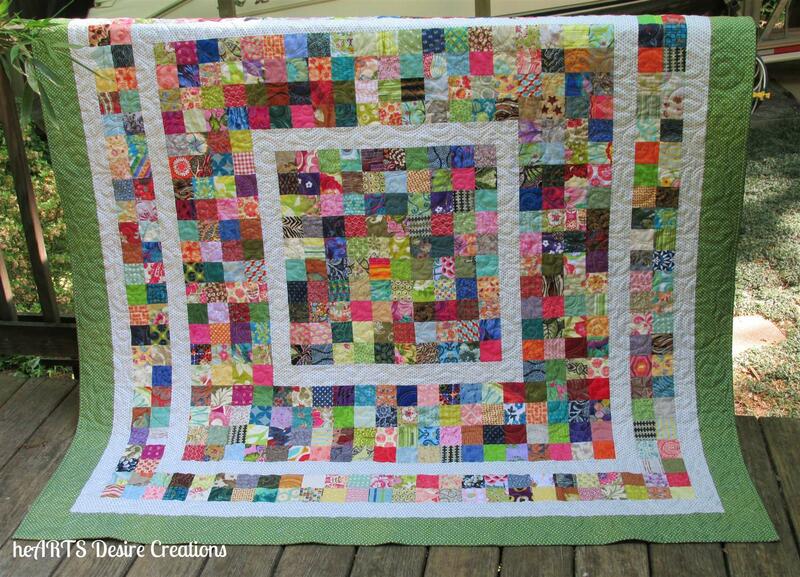 This is a charity quilt and will go to a child that is hospitalized. 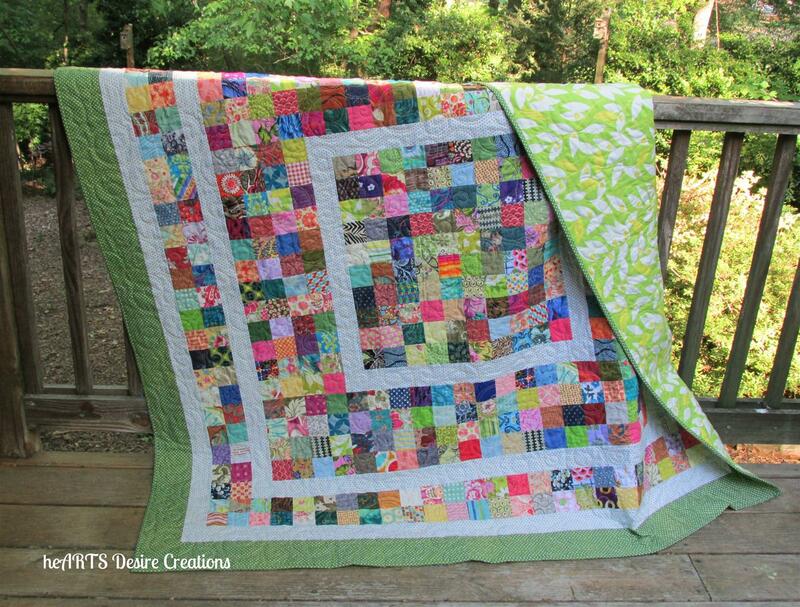 The center of this scrappy quilt has 100 patches. There are 492 pieces in the quilt – not as many as I originally planned. I was going to do a pieced border until I discovered the green with white polka dot fabric in my stash and fell in love. There are some duplicates in the 2 ½” squares. Once again I’m amazed that when these are pieced it becomes yardage, yet my scrap bins do not reduce in bulk at all! Now I have two more quilts that just need binding. Oh how I want to cut out a new project but am resisting the temptation. May be this fall? But now it is glorious spring. 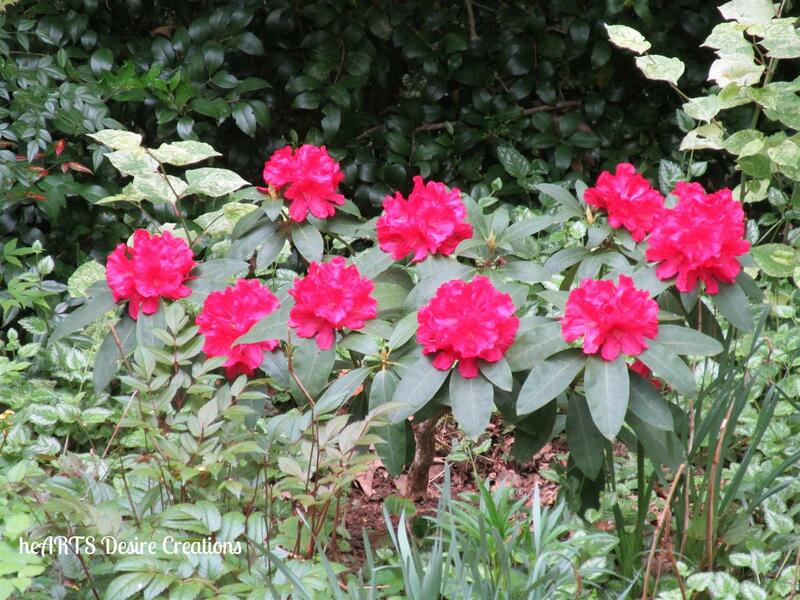 I love these red rhododendrons. Temperatures have been perfect to get some much needed weeding and mulching done. The rewards, as in sewing, are great. 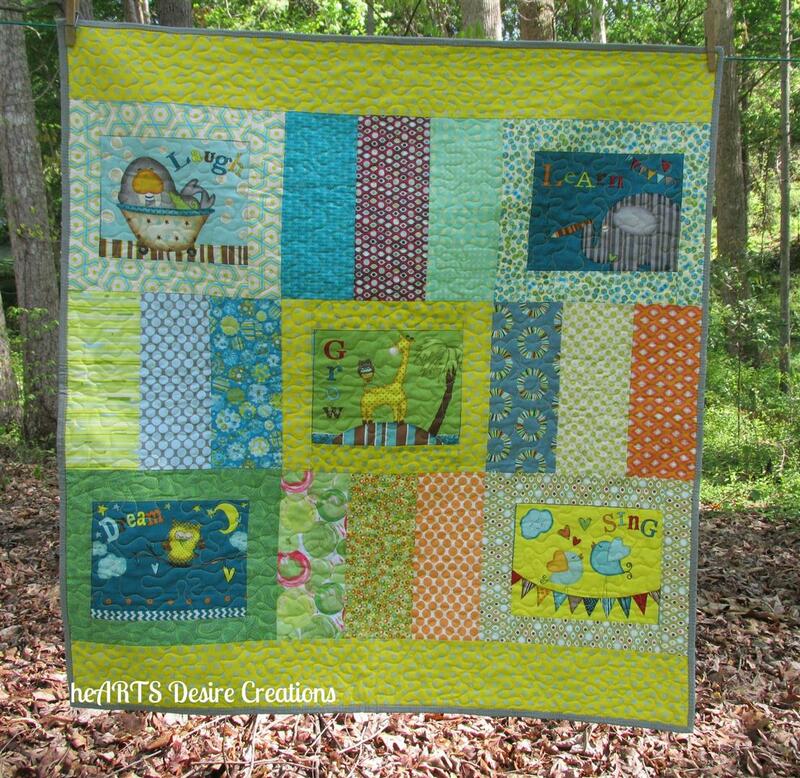 Posted in Fabric, Quilting and tagged charity quilts, Color, flowers, garden, Quilting, Quilts, Scraps, Sewing, UFOs. Bookmark the permalink. You know, I have the same problem with my scraps. As hard as I try to use them up, they just seem to keep on growing. The quilts look very nice. I am sure you are glad they are finish so you can move on to another new project. Thanks for sharing. Thank you! It is fun to work with the scraps and remember all we have used them for.